It is that time of the year again...No, not Christmas, I am talking about Winter Solstice (冬至). For the Chinese, it is one of the important dates of the year. Since winter solstice is the longest night in winter, therefore passing it represent that things would get better, since the days will get longer again. Thus a celebration is called for when you have 'survived' the longest day in winter. The Winter Solstice celebration is common amongst the East Asians, and Winter Solstice is also celebrated by the Germanic people as Yule-tide, the precursor (pagan version) of Christmas. For the Chinese, the Winter Solstice festival is an opportunity for family reunions. Family gatherings will then eat glutinous rice balls. Usually white or white and red glutinous balls are made, offered to deities and ancestors and shared amongst family members. They can be eaten in dark sugar syrup, or in a sweetened broth or rolled with peanuts. I usually make a four-coloured version to represent the four seasons: white, red, yellow, green and eaten with fragrant screw-pine scented soup. The balls are usually made without any filling but this year I decided to make glutinous white and black glutinous rice balls with filling. 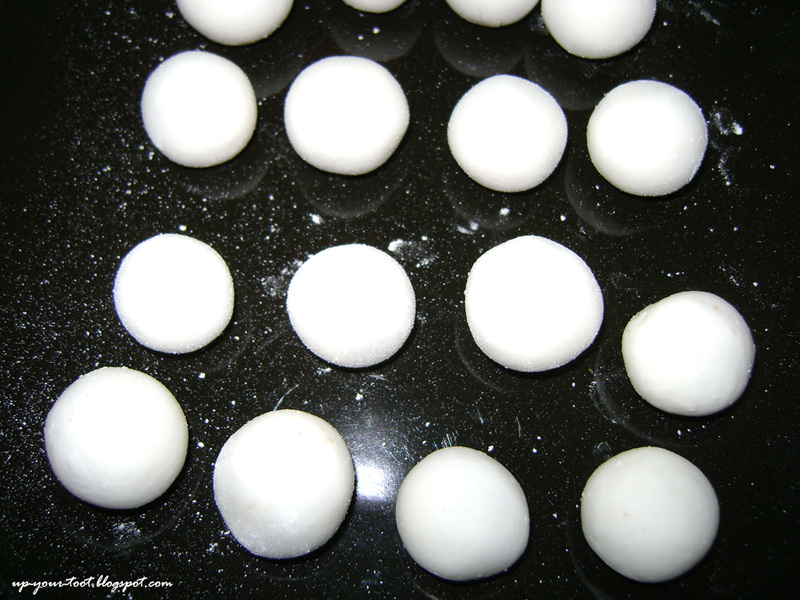 Here's my black and white five prosperity glutinous balls in soya milk. 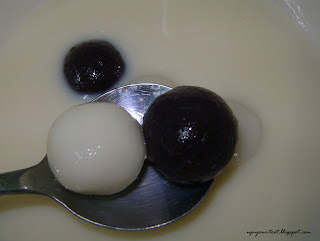 Black and White Glutinous Rice Balls in Soya Milk. Perhaps they can represent the Yin-Yang symbol. 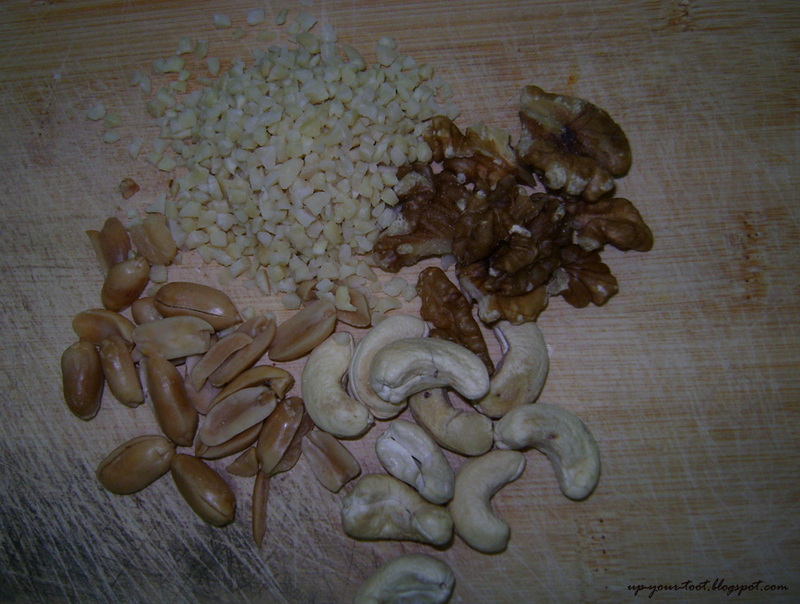 The different nuts before being chopped. Chop the whole nuts into small bits and pieces. Make sure they are about the same size. Put all the nuts (except the dessicated coconut) in a pan. Over a low flame/heat, toast them for about 3 - 5 min until they are fragrant. Make sure you keep stirring them to prevent them from burning. You know the nuts are ready when you hear them sizzling as they release their oils and the smallest bits start to brown. Remove from heat and keep stirring for 2 minutes or until cooled. 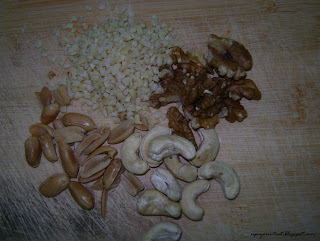 Pour the nuts into a blender/grinder and blend until they are fine and stick together. It is OK if some of them are still rough bits and pieces as you want some texture from them. Pour the dessicated coconut and quickly toast them over low heat till just slightly yellow. Add to the nut mixture and add the sugar. You can reduce or increase the sugar according to your taste. Blend them again to mix them and pour the mixture (should be at least a crumbly paste) onto a plate. Add some light cooking oil (eg. 1 teaspoon of canola oil or corn oil) to help bind and make it easy for you to roll the filling. If you've added too much oil, increase the nuts proportionately to absorb the oil. Roll the filling into small (about 1cm in diameter) balls. Set aside in the refrigerator to stiffen the mixture. The filling rolled out and ready to be chilled. There are many ways to get springy chewy balls. One is to thoroughly knead the dough to pull the gluten. Another method is to add a secondary kind of flour, usually cooked through like mung bean or potato starch. A third method is to use up to 1/3 of the glutinous rice flour that has been added with boiling hot water and rapidly stirred. This cooks the starch and denatures the gluten, making it springy. Use syrup as part of the mixture to form a stiff, malleable dough. This makes the starch sweet and you do not have to soak it in syrup before eating. 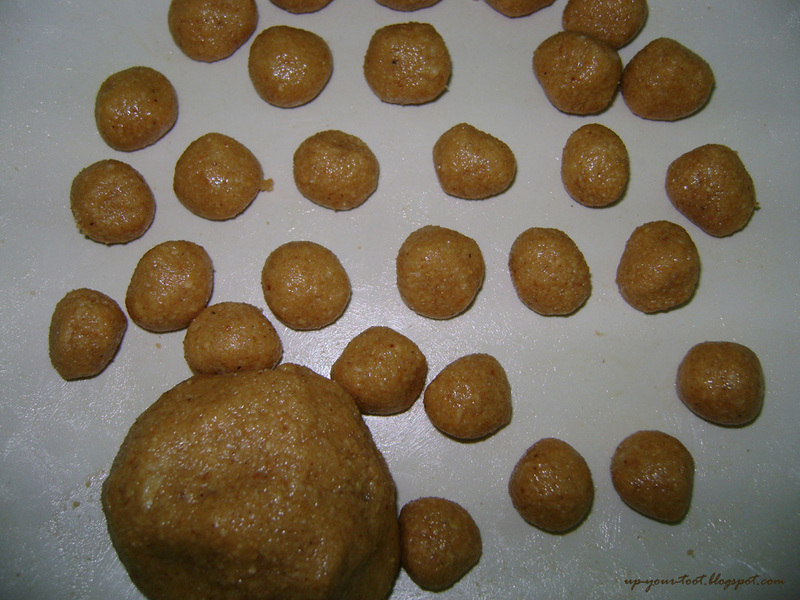 A small bowl of flour will make about 24 - 36 balls, depending on the size of the glutinous rice balls. You can make 'black' (purple actually) glutinous rice balls by using black glutinous rice flour. Use around 80% black glutinous rice flour and 20% normal glutinous rice flour to make the dough smoother and hold better. You can use 100% black rice flour dough, but the balls will be grainy (not bouncy) like eating black glutinous rice pudding (bubur pulut hitam) and it will severely colour the liquid if left standing for too long. I like the gritty texture of 100% black glutinous rice balls. Just make sure you use syrup water to make the dough or else it will not be sweet enough (or adjust the filling by over sweetening it). Make a small ball out of the dough and then stick your thumb in it. With your index finger, slowly thin it out so that you get a concave shaped disc or a bowl like shape. Place the pre-rolled filling and close it up. Roll the ball and ensure that the filling is completely sealed in. Cover the already rolled balls to prevent them from cracking. You can also roll the balls sttraight into a pot of boiling water. Get a pot of water, making sure that the pot is deep enough. 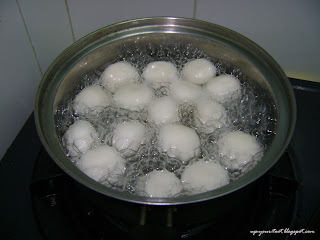 Make sure that the water has come to a rolling boil before putting in the balls. Leave the balls to cook in the boiling water. When they are done, they will float to the surface. If you are cooking black glutinous rice balls, do let them cook a little longer as the starch imbibes at a slower rate. Once the balls have floated to the surface, scoop them up and transfer them into the bowl/pot of cold water. These balls are ready to be lifted off the pot into a bowl of cold water since they have floated to the surface of the boiling water. Wait for it to cool down before serving them. If you need to keep them a day or so, transfer them to a new bowl of cold water. Make sure you keep black glutinous rice balls separate from the white glutinous rice balls as the colour will transfer. 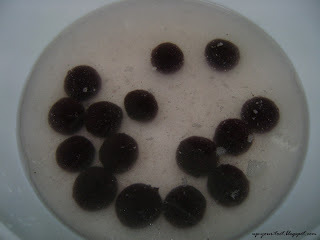 The cooked black glutinous rice balls in cold water. They tend to stain the water so keep them separated from the white balls. This look like fun to make! Longest day here and Christmas is expected to be 37 degree Celsius here. As kids we love to make glutinous rice balls. We would mix different food dye to make marble like balls. So I heard that it would be a hot Christmas and today was 40 deg. My godmother and family is escaping the heat of ADL today. They should be in KL by tonight. Sean, you are in Australia like Diana too? It is quite cold in Malaysia. It rains every day. In fact it rained the whole day today. It is 29C inside the house and definitely colder outside. Your Tong Yuen looks good. I have yet to try the black one. I would look out for black glutinous rice. I marvel with your broad knowledge. I have just been to Diana's blog so figured you have to be in KL. No poppy to be grown here. Shall check out Giant for the black glutinous rice. Thanks. I wish we can grow poppies, at least oriental poppies. I got the flour at Giant Shah Alam Sect 13.